Loikow – Myanmar has been a battleground for decades. A long civil war has displaced more than 640,000 people within Myanmar. In Kayah State, the war has internally displaced more than 34,000 persons and close to 12,000 refugees remain in two camps in the Mae Hong Son province of Thailand bordering Myanmar. Myanmar has limited resources and services. Refugees returning from Thailand may accentuate scarcity in underserved communities and exacerbate intra-community conflicts. In Kayah State, remote areas have very limited international aid presence and rely largely on local churches and national non-governmental organizations for humanitarian assistance. Within this context, the Jesuit Refugee Service (JRS) supports educational empowerment and builds peace and reconciliation across ethnic, tribal, and religious communities. JRS aims to promote common understanding and mutual trust between potential host communities in Kayah State and returning internally displaced persons (IDPs) and refugees. In 2017, JRS facilitated several sessions about peace building for teachers and other key JRS partners in Myanmar. These sessions focused on understanding levels of conflict and exploring ways of peaceful living within the family and larger community. This was accomplished through activities that included focus group discussion, brainstorming, storytelling, games and role-plays. Since most participants had direct experience living in and working with the communities that have been experiencing conflicts for decades, participants learned from one another through the activities. Sharing their own real stories was particularly powerful and discussions included conversations regarding conflicts related to religious and ethnic minorities, schools and communities, and land issues. In continuation of these sessions, JRS launched The Peace Education Project in Myanmar in November 2017. The Project addresses challenges faced by potential host communities, internally displaced persons, and returning refugees by promoting peaceful coexistence between all parties. The Peace Education Project targets students in community schools and IDPs in camps in Myanmar. Peace education training workshops will be provided in Kayah and Kachin States at all levels: adults, adolescents, and children. Training workshops are planned to occur at four IDP camps in 2018 in Myitkyina, in Kachin State, and at two nursery schools in Loikaw, in Kayah State. 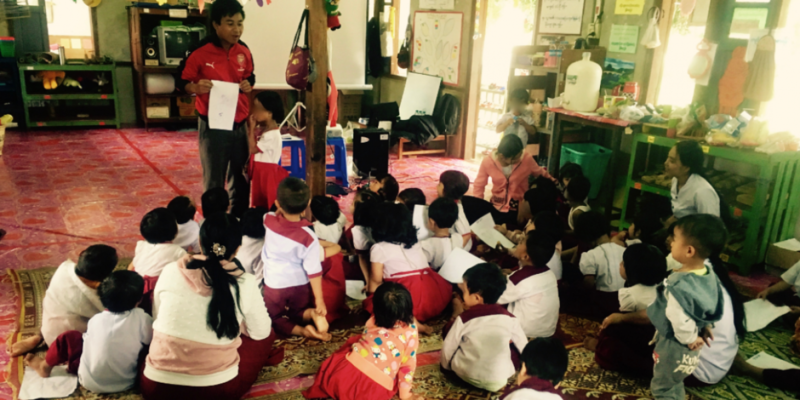 Fr Aloysius Bi SJ undertook his first experience as a peace education teacher in a nursery school in Loikaw in November 2017. Mr Mariano, the Education Officer in Loikaw, accompanied Fr Bi and helped by translating peace education games. “I have conducted numerous seminars, but the one at a nursery school in Loikow was certainly the most challenging,” says Fr Bi.